Pininfarina designed the first Chinese coupé-cabriolet five years ago for Chery Automobile, dubbed the M14. To be now called the A3CC, after many stalls along the way including problems with the developing the folding roof, production dawns. The Fondazione Italia Cine (Italy-China Foundation) recently assigned to Pininfarina the Capital Elite - Best Made in Italy Design Example award, one of the most prestigious awards of the China Awards, during the fifth edition of the ceremony dedicated to companies, institutions and personalities who better have seized the opportunities offered by economic and cultural relations between Italy and China. Paolo Pininfarina, chairman of the group collected the award this award during a ceremony which was held at the Palazzo Mezzanotte, Milan. The award comes just a few days after the opening of a Pininfarina Company in the district of Shanghai as a result of an agreement with the government agency Shanghai International AutoCity Development (SIAD), which is supporting the start-up of the new site and, in general, the relations with institutions, customers and suppliers. Hence, the Pininfarina Automotive Engineering (Shanghai) Co. Ltd. is born, a Product Development Centre which will allow Pininfarina to develop part of the engineering activities for the Chinese OEM near them and, in some cases, with them, so as to better respond to the growing needs of that market. "China is currently one of the few automotive markets which are expected to significantly grow in the coming years," says the CEO Pietro Silvio Angori. "All major companies in the world have now established a permanent organization on the spot to take advantage of market developments, which now requires services of high technical content and a local presence. The Chinese market is for Pininfarina by far the most important and the decision to have a significant presence in Shanghai – when fully operative it will employ a few dozen highly professional people - has been facilitated through the offer by local authorities of particular benefits for the establishment and ongoing cultural and relational support aimed at the development of our activities in that area". Two more preliminary agreements were signed before summer including collaborations with Tsinghua University in Beijing and the Tong Ji University in Shanghai for joint training of personnel and research activities in fields ranging from design architecture of the vehicle and virtual and physical validation of prototypes, as well as conferences, workshops and internship projects aimed at cross-fertilization. Since 1996, Pininfarina has extended the range of its activities on the Chinese market, developing projects with several manufacturers: AviChina (Hafei), Chery, Changfeng, Brilliance and JAC. At the 2010 Beijing Motor Show there were seven premium car models on display that were designed and engineered for the Chinese clients Brilliance, JAC and Chery. Among them, the restyled Brilliance Junjie, designed and engineered by Pininfarina, made its world debut in saloon and station wagon versions, based on the previous versions also designed by Pininfarina, allowing Brilliance to establish itself as a premium brand. Other models recently introduced on the market by Pininfarina’s important Chinese clients included two and three-box versions of the Chery A3 and two models for JAC (Anhui Jianghaui Automobile Co. Ltd.): the B-MPV and the B-Class saloon, which won awards such as the “2009 China’s Annual Best Medium-Size Car" and the Annual Expectation Auto Model. 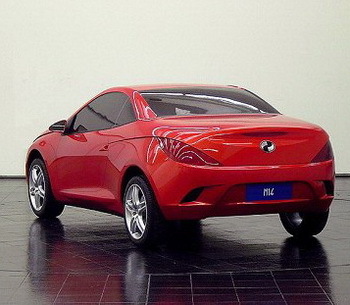 The 3-box A108 (Tojoy) saloon was also designed and developed for JAC, whom Pininfarina has been working with since 2005; this highly successful model was the first Chinese car to win the prestigious China New-vehicle APEAL (Automotive, Performance, Execution and Layout) Segment Award assigned by J.D. Power (Asia Pacific).